Laser medium looks at the different substances used to create the beam. Each of these component gases serves a very distinct purpose within the medium, and each must maintain a purity level more than 99.5 %. Helium, regarding percentage, is by far the largest at approximately 65% of the mix. Its purpose is to act as the coolant within the gas chamber. The second largest by percentage is Nitrogen at 30% of the mix. Nitrogen’s purpose is to be the stabilizing agent. It helps to stabilize the wave frequency within the gas chamber. Finally, Carbon Dioxide comes in at 5% of the medium mix. Carbon Dioxide represents the gas in the medium that produces the lazing action. It is the Carbon Dioxide atoms that get excited. Even though the Carbon Dioxide represents the smallest percentage of gas in the medium mix, it is still called a Carbon Dioxide industrial laser, because it is the Carbon Dioxide that is responsible for the lazing action. If the percentage of Carbon Dioxide was to be increased there would be a corresponding increase in the amount of power produced. However, the wave frequency will be less stable with an increase of just 5%. The average laser will use approximately 100 liters of mixed gas per hour, which would break down as the same number of liters as the percentages in the mix: 65 liters of Helium an hour, 30 liters of Nitrogen an hour, and 5 liters of Carbon Dioxide an hour. As the laser gases come from the mixing unit they are forced through what is known as a resonator. The gases are forced through at nearly the speed of sound, compressing the medium gases. These gases are then excited with an extremely high voltage to produce the plasma. The source of excitation comes from a high voltage power supply, one that can produce 20,000,000 volts (20Kv). From there, a modulator controls the current being supplied to the resonator. It should be noted that a laser uses energy very inefficiently. Less than 10% of the total electricity put into the laser is converted into laser light. The remaining 90% of the energy is released as heat and removed through the cooling system. Carbon Dioxide lasers employ several different methods to produce the lazing. The “Slow Axial Flow” styles are the lowest powered, developing up to 1500 watts of power. Because the length of the laser chamber, resonator optics and the need for cooling the resonator tube make the Slow Axial flow laser an inefficient machine, figure 1. The “Fast Axial Flow” style ensures both that the resonator is compact, and the power remains stable through time and temperature. This method is one of the most common in the sheet metal industry with power ratings up to 3.5 kilowatts and higher at the cutting head and generates the maximum power in the shortest possible length, figures 1 and 2. “Transverse flow” lasers are some of the most powerful of the lasers in use, with up to 45 kilowatts for a very short distance. This laser’s transverse flow configuration produces a very poor mode quality. But, by employing brute force, this style of the laser can forgo the pulsing action normally required for optimum laser output in cutting applications. The “DC-excitation” method is also Carbon Dioxide (CO2 ) laser, but, unlike the others, the DC-excitation system uses cathodes and anodes to supply the 20,000 volts necessary to excite the Carbon Dioxide medium. The DC-excitation has some problems with electrode erosion at the cathode. Heavy ionized particles bombard the metal in the cathode and break away atoms. These atoms are then deposited on the first cold surface they encounter. In recent years problems associated with that event have been eliminated. On the positive side, the DC-excitation method is best known for its pulsing abilities and the control that is possible across the entire dynamic range of operation. The final method for producing a laser is the ‘RF-excitation” laser It uses radio waves to excite the Carbon Dioxide medium. The radio waves that are employed run in the 13 to 27 megahertz range at 2000 to 5000 volts to produce the lazing event. This method has also removed the problems with electrode erosion (no electrodes) but maintains all of the benefits of the DC-excitation laser: good pulsing characteristics, and the same power control across the full dynamic range of operation. Inside the resonator, there are the reflecting mirrors at both ends. The rear mirror is made of germanium, a completely reflective substance. The mirrored surface at the output coupler end is only partially reflective and is made of zinc selenide. With the possible addition of two more reflecting mirrors, we have the basic resonator. All reflecting mirrors are made of germanium and also completely reflective. The distance between these mirrors is critical with tolerances of plus or minus .00004. To keep the heat of the lazing process from disturbing the mirrors, all of the optics are cooled with water. The parts of the optics are mounted away from the reflecting surfaces; this makes cleaning and/or replacement possible without the need for realignment of the mirrors. Small amounts of thermal energy are released from the rear reflecting mirror where it is converted into an electrical signal. It is common practice to make a measurement after any adjustment to the optics from within the resonator. The process of checking involves a “mode burn”. A mode burn is made into a piece of acrylic plastic, targeting a .625 (15.87mm) diameter beam onto the acrylic. The acrylic will then depict an accurate representation of the energy beam and how it is being delivered as shown in figure 3. The burn acrylic plastic should have a smooth inner surface and radius edges. By measuring the depth of the shot, the power of the laser may also be determined. Inside the laser, there are different modes or levels of energy distribution. Some of the modes are perfect for cutting, while those in the higher powers are better suited for welding or heat treating processes. When the laser beam exits the resonator, it travels through the output coupler and exits as a .625 (15.87mm) diameter beam. From this point, the beam will remain a .625 (15.87mm) diameter beam until it either hits an obstruction or is refocused into a cutting or welding beam, with no real limits to the distance traveled from output to focus. In the laser system, the beam exits the output coupler then is redirected by the bending mirror. The beam is then absorbed by the focal lens where it is converted into a concentrated beam of light approximately .008 (0.21mm) to .009 (0.23mm) in diameter. For cutting mild cold rolled steel under normal conditions, the focal point should be set at the top surface of the material. That will, in essence, put the peak energy of the laser beam at or just below the surface of the material. As with most things in the sheet metal trade, mild cold rolled steel is used as the base line reference for focal point adjustments. By default, this becomes the “0” point or base line from which all changes are made. Because of the large variety of materials being processed, it may become necessary to adjust the focus each time you change material types and thicknesses. For example, aluminum and stainless steel both require the focus to be midway through the material or the bottom of the sheet, depending on material specifics. When the beam is focused below the surface of the material (below zero) the beam will actually increase in width. Or to put it another way, it provides more energy at the given point inside the material thickness. The series of delicate optic components at the end laser beam delivery system is known as the “focal lens”. The focal lens is the final link in the chain before the light waves diverge. There are many varieties and styles of the focal lens to choose from. They differentiate themselves by the way they collect and disperse light. The different shapes and thickness of lenses create a varied selection of energy disbursement within individual beams. The focal lens is the last piece in the system and is the most often handled by the operator. It is in need of regular cleaning and must be kept free of pits and scratches. These lenses need to be cleaned with one of the following chemicals: acetone, alcohol or methanol. Should the lens be allowed to get pitted or scratched, it could cause the laser beam to diffuse or to be diverted, which of course means a loss of energy in the cutting process. Carbon Dioxide (CO2 ) laser – A far inferred laser at 10.6mm. Nd: Yag laser – A near inferred laser at 1.06 mm. The Excimer – An ultraviolet gas laser in ranges from 0.19 mm to 0.31 mm. As stated before, the Carbon Dioxide laser is by far the most common within the sheet metal industry and for the processing of non-metallic materials. The Nd: Yag laser is best suited for cutting aerospace materials, manufacturing of micro circuits, hermetically sealing items, and hole drilling. This family of lasers is best suited for micromachining applications and microcircuit mask making processes. Average power, dynamic power, pulse shape, repetition rate, and continuous wave. Polarization, beam quality (divergence), profile, beam size, and propagation. Naturally occurring drift and induced drift from the base parameters. The laser beams power is defined as the rate of energy flow in watts (joules per second). Continuous wave and the average power rating should be adjustable over a given range. That range is known as the “dynamic power” range. Pulse agility is the ability of the laser to produce a range of differently shaped pulses, peak power ratings, and the repetition rates. A gated pulse refers to the chopping up by either mechanical or electrical means of the continuous] wave (CW) power. A spike pulse is a narrow, high-peak-power pulse obtained through the use of electrical or optical means. Super-enhanced pulses are basically a gated pulse with a leading spike pulse. Finally, the Hyper-pulse are spike pulses superimposed over continuous wave power. 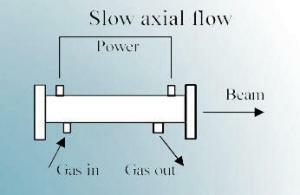 Figure 4 shows all of the different beam power modes. Many lasers are limited to one pulse mode or another and some are programmable, an essential part of the modern machine for increasing the lasers’ abilities. The second parameter of a laser beam is the spectral properties of the beam. The spectral properties are defined by the medium which sets the wavelength of the beam, although some machines can “tune” the frequency over a small range. Tuning is not commonly used because small changes in wavelength generally have little effect on the cutting process. This tuning process is known “wave agility”. The propagation axis is the direction the beam will travel after leaving the resonator. The intensity profile of the beam is set by the type or style of the resonator. As the beam leaves the resonator, its size and its distribution change with the laws of diffraction. Every laser beam has a virtual minimum diameter known as the waist. From the waist the beam will expand at a constant angular rate; this is called the beam divergence. 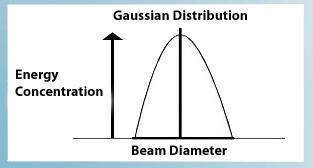 The perfect beam has Gaussian (TEMoo) to display its intensity profile, figure 5. Beam divergence is described as the “diffraction limited divergence”, which means that if a given beam with a standard waist size will exhibit a higher degree of divergence as each of the higher beam modes are employed, there is a directly related drop in beam quality. The ratio of that divergence is called the “times diffraction limited” or TDL for short. The polarization of the beam describes the electrical orientation of the magnetic field. A linear polarization is where the electronic field oscillates in only one plane. If the oscillation changes direction over time, it is called a random field. If it oscillates along two planes at right angles to each other, it is a circular polarization. The stability of the laser beam is defined by the long and short term drift inside the parameters of the beam. Once the laser beam leaves the resonator, it will continue to travel in a straight line until interrupted with optical devices such as mirrors or is guided by fiber optics to get the beam to the focusing lens and then onto the material to be worked. The idea is to take a beam .625 (15.87mm) in diameter and focus it down to a pinpoint of light on or somewhere below the surface of the material to be worked. The gas assist system relies on a nozzle that is located below the focusing mirror and extends to the surface of the material. The gas assist has two objectives: first, using the high pressure to blow material out of the kerf (cut), or at low pressure to retard the oxidation within the weld pool. The beam should be perpendicular and centered squarely in the nozzle at all times. It must also maintain a constant position relative to the material being worked to obtain the best product quality. The average focal length on machines using spherical lenses with a cone angle ranging from 4 to 10 should be between .984 (25mm) and 9.482 (250mm). This is also the distance from the workpiece to the lens. Sealed inside a purged tube, the laser beam is moved from the resonator to the focal lens. The reason for the purged enclosure is to keep environmental distortions from occurring. Even dust particles and other micro-impurities in the air can disrupt the laser beam. The enclosure is also a safety device and helps to protect those who are working on the laser from unnecessary exposure to radiation. Fiber optics (dielectric fibers) are the second most common way in which a laser beam can be manipulated. There are two basic styles of laser: the fixed beam and the flying optics style. The flying optics lasers are most often the ones to employ fiber optics, as the material being processed remains fixed while the laser beam moves. The fixed beam, on the other hand, has the material move and the beam stays fixed. In the area of focusing there are two categories of “auto focus systems”: contact and non-contact. In the contact group, there are three subdivisions: the contact foot, the ball follower and the capacitive ring. The capacitive ring rides on the surface of the material and sets the capacitance from the tip of the ring and the capacitor plate. The capacitive ring sensor is meant for use with metallic and non-metallic materials. The contact foot style of focusing system consists of no more than a curved contact fork that slides across the workpiece and is mounted on the base of the head. The ball follower head moves vertically using gravity; the balls rest on the surface of the material rolling across the surface as the material is moved about. The non-contact style of auto focus uses capacitive sensors to judge the distance between the nozzle and the workpiece. In this type of system, there is no physical contact between the head and the workpiece. There are two subgroups in the non-contact focus systems. The first and most common style has isolated the nozzle electrically forming a capacitor, with the workpiece being the other plate. The laser then measures the capacitance between the nozzle and workpiece to judge the correct focus. The second style of non-contact focusing device uses a capacitive sensor ring that acts as the upper plate rather than the nozzle. The advantage of the ring over the nozzle is in the variety of interchangeable tips and nozzles that will fit. However, it is physically a fragile system. There are three components required for the auto focus systems. First, the vertical adjustment; this keeps the focal point in relation to the materials that are being worked. Second, adjustment mechanisms of the X and Y axis (horizontal) are used to keep the beam centered to avoid clipping the tip as the beam exits. The third major adjustment of the auto focus system is the “Z” axis drive function. This adjusts linear traverse speeds, usually from 0 to 600 inches per minute, with a maximum rate increase of 60 inches per minute. Laser materials processing (LMP) covers all of the possible laser uses. Laser material processing is the art of changing the state of a given material through the application of laser energy. When a laser optical radiation strikes a surface, a small percentage of that energy is absorbed by the material; this energy turns into heat. The power density of the laser beam directly influences the amount of heating that occurs in the material. alloy, hard face zone refining.